Begin the first day of the Spiti and Kinnaur Innova tour with your friendly driver in Chandigarh. Traverse from the four laned highways of Punjab to the windy mountainous roads of Himachal Pradesh. Reach Shimla during the day and explore this popular hill station. Shimla was popular during the pre-independence era as it served as a summer paradise for those wishing to escape the heat. Needless to say, the weather in Shimla will be pleasant during most parts of the year at a height of 7, 200 feet. Located at the foothills of the mighty Himalayas, Shimla provides a rousing blend of modern comforts and rustic thrills. While it’s a mere 3.5-hour drive to Shimla, we recommend spending a night in Shimla as the body gets acclimatized to the mountainous terrain. On the second day of this Spiti and Kinnaur Innova tour, we begin driving deeper into the mountains towards the Sangla Valley. The first stop is in Sarahan, renowned for the famous Bhima Kali temple. Infamous for its human sacrifices in the eighteenth century, today it is popular with tourists for the magnificent architecture. Driving along further, this stunning 95 kilometre stretch with the Bapsa river magically weaving through the forested slopes is a sight to behold. Known predominately for its agriculture, every house in Sangla will have cultivations of apples, pears, walnuts, apricots or potatoes. After lunch, we visit Chitkul – one of the most scenic settlements in the valley and the last inhabited village before the India-China border. Walk around the Bapsa river and pay tributes to the Mathi Goddess at the temple in the village. After spending time in Chitkul, we head back to Sangla to rest in our comfortable camp. On the third day of this Spiti Valley Tour, from Sangla, you will head towards Reckong Peo – the district capital of Kinnaur. Upon completing formalities which are required to obtain a permit to enter the coveted Spiti Valley, you will navigate a meandering road towards Kalpa; a village that is believed to have been the winter home of Lord Shiva. When you’re there, don’t miss the 79 foot, monolithic, colour-changing rock moulded in the shape of the Shivalinga. Additionally, with breathtaking views of Mount Kinner Kailash and the Jorkandan Peaks, Kalpa offers visual treats like nothing you’ve seen before. Other interesting sights in Kalpa include the Chakka Khanda meadows, the unique, Kinnauri-style temples in the Narayan-Nagini temple complex or the vibrant, Samdrup Choeling Gompa. From Kalpa, we continue driving on the famous Hindustan – Tibet Highway or the NH 22. Despite these roads being described as some of the most treacherous in the world, rest assured that your driver is more than experienced to bring you safely to your next destination. Before reaching, however, make sure you enjoy the beauty of Puh onwards to Nako – the last hamlet of Kinnaur, as you make your way into the gorgeous Spiti Valley. After a long day’s journey, you will spend the night at a basic guest house in Nako. known as the ‘Ajanta of the Himalayas’. Tabo is one of only two towns in Spiti Valley and is famous for housing a UNESCO World Heritage site – the 1010-year old Tabo Monastery, which is worth a visit. The paintings and statues weave stories about The Buddha and Buddhism and one can spend hours just admiring the beauty and splendour of this monastery. After exploring Tabo you will halt overnight in the town in a hotel. After exploring Tabo, you will drive towards for Dhankar, the former capital of the Spiti Valley. Offering a panoramic views of the valley, Dhankar stands perched above the confluence of the Spiti and Pin river. Perhaps there must have been a fort here once, but today Dhankar is renowned for its 1200-year old monastery balanced precariously on a rocky precipice. If time and energy permit, do the easy 45 minute trek to the stunning turquoise coloured Dhankar Lake. Gain a better understanding of the Spiti culture as you spend this night in a homestay. Enjoy authentic, freshly prepared cuisines and sleep in the comforts of a clean, warm and comfortable bed. On the fifth day of this Spiti Valley tour, drive to the charming and high villages of Lalung and Demul. Literally translated to the ‘land of God’, Lhalung is located at the foot of the Tangmar Mountains which offer a sight to behold. At Lhalung, we will visit what is purported to be the oldest gompas in Spiti Valley. The Lhalung Monastery, also called the Golden Temple or Sarkhang is an architectural marvel and one can spend hours admiring the ancient structure. Further, the paintings in this monastery are beautiful to witness, albeit faded over time. Demul, which is a remote human settlement cut off from the rest of the world for most part due to lack of cell-phone reception or internet access. You can either explore this quaint village, interacting with the small number of locals or we could take a traditional, but short yak safari through the village. At Demul, the lucky traveller who arrives at harvest time can partake in a traditional north-eastern cooking experience; using Yher leaves to make momo fillings with the locals. By evening, drive to Kaza, the commercial capital of the Spiti valley and spend the night in a hotel. Day 6 of the Spiti and Kinnaur Innova tour is a day for soaring. This means that you will be visiting two of the highest human settlements in Asia. First, you will drive to Komik, which is famously known as the highest village of Asia.From being the only farmland in barren Spiti Valley, to being the home of exotic fauna such as the snow leopard and Tibetan wolf; from housing one of the highest monasteries in the world; the Komik Lundup Chhemo; at over 15, 000 feet, to being one of the remotest human settlements in the world; Komik can holds inimitable appeal. At the right time of the year, travellers can partake in the famous annual festival which is a spectrum of colour and gaiety. From one high-altitude settlement to another, you will then arrive at Langza. This fossiliferous region holds immense appeal to the history-lover. From the 1000-year of Lang ( temple ) to the prehistoric archaeological excavations found in plenty here, there is much to explore at Langza. Langza belongs to the Sakyapa sect of Tibetan Buddhism. After feeling on top of the world, you will return to Kaza from and spend the night in the hotel. DAY 7: Drive from Kaza – Ki Monastery – Tashigang – Gette – Chicham – Kibber. On the seventh day of this Spiti Valley tour, you will go from Kaza to the gorgeous Ki Monastery which is set atop a cliff at a height of 13, 668 feet. Set against a breath-taking backdrop of snow-capped mountains and overlooking the vast plains of Spiti Valley and river, Ki Monastery stands tall and proud. Built in Pasada style, the Monastery is teeming with Buddhist history, culture, learning and worship. If you arrive in time, we can witness the divine prayer offering ceremony by the monks and nuns. From the monastery, we will head on towards our pit stop for the day – Kibber village. This uncharacteristically fertile region is a welcome change from the desert lands of Spiti and serves as a popular base camp for Himlayan trekkers. We will explore this interesting high-altitude settlement which is also a popular base camp to embark on adventure and treks to adjoining mountains of high altitude. Houses constructed in the Tibetan architectural style are predominant and the fertility of the rich lands makes agriculture the primary source of livelihood. After a day of wonders, you will return to your hotel in Kaza for a for a hot supper and a good night’s rest. On the eight day of this Spiti Valley tour, you will discover that a trip to Spiti Valley is incomplete without seeing the moon of earth; aka, the Chandratal Lake. The scenic location is a blend of water, sky and mountain all in one breath-taking view. 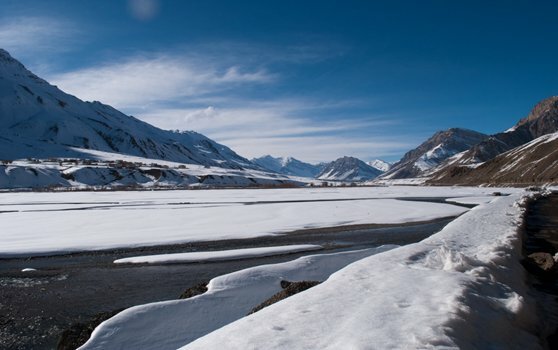 Situated at a height of 14, 101 feet, Chandratal Lake is frozen for most part of the year. However, the lake is a stunning depiction of nature’s flair and should not be missed. Otherwise barren and bereft of any human settlement, the blue lake bordered by carpeted green meadows couple with the pristine white of the Chandra Bhaga mountain range makes this an ideal camping ground. Live your dream of camping comfortably in state of the art Swiss tents in the Himalayas as you spend your evening gazing at the Milky Way and the millions of stars on a clear night. DAY 9: Drive from Chandratal Lake – Batal – Chattru – Rohtang La – Manali. On the ninth day of this Spiti Valley tour, upon soaking in the splendour of these scenic spots, you will drive on the Kaza – Manali road, past the magnificent Rohtang Pass and onwards to Manali where your exciting yet comfortable Spiti Valley tour comes to a close. Spend the night in a comfortable Manali Hotel. The final day of this Spiti Valley tour leads you from the mountains back to the plains in Chandigarh. Just as your body needed time to acclimatize to the mountains in Shimla, this drive is perfect for your mind to acclimatize back into modern-day existence. Bid adieu to the picturesque valleys, blue skies, and winding rivers as you begin descending form the mountains into the plains. Return to Chandigarh by 2 PM and spend the evening reminiscing about the magic which was the last ten days. This ten day shared Spiti Valley tour costs INR 18, 450 per person. > All transfers by a comfortable non-AC Innova for ten days. > Accommodation on twin / triple sharing with breakfast and dinner at a comfortable hotel / guest house in Nako and Kaza; homestay accommodation with breakfast, lunch and dinner in Dhankar and Kibber; Comfortable hotel accommodation in Shimla and Manali on room only basis. > Camping at Chandratal Lake and Sangla with breakfast and dinner. Camping includes state of the art sleeping bags / blankets, tents and camping mattress. – Any meals in Shimla and Manali. – Any additional costs incurred in case of a medical emergency / natural disaster / breakdown of vehicle / acts of God. – Anything not mentioned in the “What’s Included” section.